The People’s Exhibition of Barrick at Museum of Nature! You are invited to the People’s Exhibition of Barrick! Barrick Out of The Canadian Museum of Nature! On Tuesday, April 24, Ottawa’s Museum of Nature will celebrate a new partnership with Barrick Gold Corporation with the unveiling of the “Barrick Salon”. Barrick Gold is a Canadian mining company based in Toronto with horrendous records of environmental destruction, and human, labor and Indigenous rights violations around the world, including but not limiting to Chile, Argentina, Peru, Tanzania and Papua New Guinea. This newly established public-private partnership between the Canadian Museum of Nature and Barrick Gold Corporation is fundamentally unacceptable! Because it contradicts the museum’s most important corporate value – “Respect for People and Nature”. For more information about Barrick Gold and the communities impacted by Barrick’s operation: Protestbarrick.net. 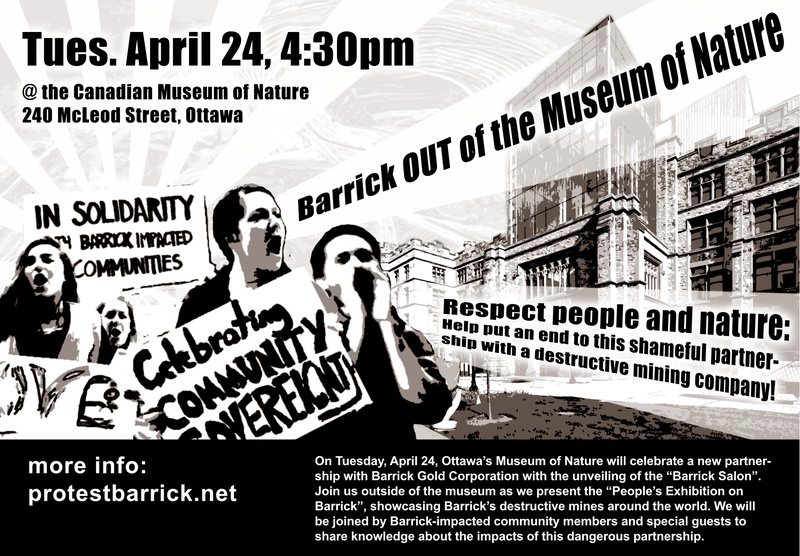 This public-private partnership is offensive, we want Barrick Out of The Canadian Museum of Nature! Barrick Gold is the world’s largest gold mining company, founded and chaired by Peter Munk. With a former Prime Minister on their board and former executives sitting on the board of the Canadian Pension Plan, Barrick enjoys government funding and diplomatic support. In countries like Australia, Chile, Papua New Guinea and Tanzania, Barrick takes advantage of inadequate and poorly enforced regulatory controls to rob indigenous peoples of their lands, destroy sensitive ecosystems and agricultural land, support brutal police and security operations, and sue anyone who tries to report on it. In the context of this libel chill, Barrick has branded itself as the socially responsible mining giant and boasts its listing on the Dow Jones Sustainability Index. Behind the scenes, Barrick has been singled out as the company most involved in the lobbying effort to stop private member’s bill C-300.